Over the last couple of months, I’ve been playing loads of rhythm games. Thanks to how import friendly many of them are, I’ve even picked up a bunch we'll never see in the west, such as IA/VT Colourful. 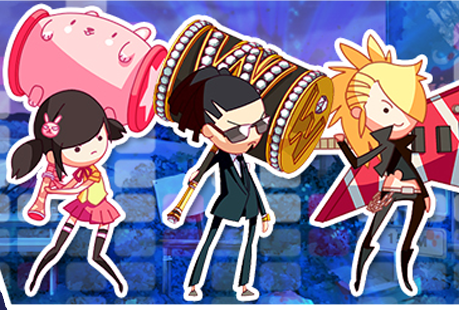 My current obsession with them made me more than excited to check out Radiohammer by Arc System Works. Radiohammer could have been a superb bite-sized rhythm game, but it is let down thanks to some glaring issues. Related reading: If you are in the mood to import a brilliant rhythm game (which is non-Japanese speaker friendly) then IA/VT is incredible. Matt's review. Radiohammer for the Nintendo 3DS does has quite a few things going for it though. The menus and interface are stylish and it controls well. Rhythm games really do need to offer multiple control schemes to suit everyone’s play styles and I’m glad Radiohammer supports various button play styles and stylus controls. You can use a combination of the face buttons and the D-pad for the main obstacle or enemies and are not restricted to a single control scheme per song. I actually found over time that using a mix of the two simultaneously really suited me. A story mode in rhythm games seems to be the in thing at the moment with games like Persona 4 Dancing All Night getting full fledged visual novels to go with the action. Unfortunately, Radiohammer’s story is minimal and only is only really delivered at the start of each episode. 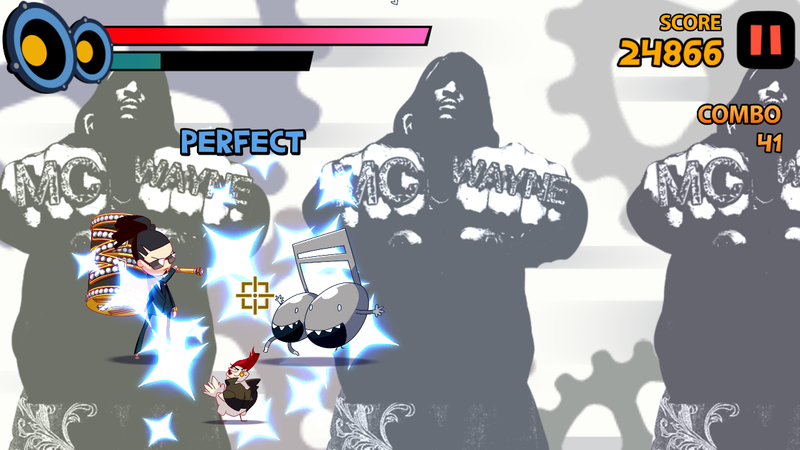 There are four DJ paths to play and each one has its own set of background environments, enemies, and bosses. Each story is split up into 14 stages and then one boss fight. Each DJ has his or her own manager that adds a nice touch in the visuals with the victory animations, and more. The core rhythm gameplay consists of using your instrument or hammer to hit obstacles coming your way. July Ann, the first DJ, gets things off to a rather eye-opening start, as she has to fend off perverts that are trying to run up to her and display their manly wares at her, against her will. I’m not joking - it's flasher central there. The rhythm game is in whacking them away with your hammer along with the music. Putting aside the very real issues in turning sexual assault into a gameplay mechanic in a rhythm, game as though it's all light hearted fun, I did love the satisfying sound for getting a perfect timed shot, because I don't think anything in a rhythm game has deserved a "perfect" more than these creeps. Barring story mode, the extras let you play any track with a particular DJ after completing his or her full story. But as much as I enjoyed going through these songs while playing, almost none of the tunes are even close to memorable enough to stick with me outside the game. With other games in the genre, I have the soundtracks on my iPhone and listen to them often, but nah, I won't be sticking these midi-quality tracks on any of my music devices any time soon. Visually Radiohammer is stylish and gets the job done for the most part. I am disappointed by the lack of 3D support. For a game that is this simple visually, some stereoscopic 3D would have been a nice touch. This is a cheap port of an iPhone game, sadly. Each DJ's adventure plays out across one major area and this changes slightly in the stages that require more than one song but enemy or obstacle design remains the same. The boss fight stages really showcase how good Radiohammer can look with fast paced action and interesting boss designs. These stages also have some really goofy dialogue for each DJ. When it comes to the actual stages, I found them far too short. Even the ones that had multiple song segments, felt abrupt in comparison to other rhythm games. This feels like the other side of the spectrum compared to the likes of IA/VT and DJMAX TECHNIKA TUNE in terms of song length and content. Related reading: Easily the best rhythm game on the 3DS is Hatsune Miku: Project Mirai DX. Matt's full review. I’m disappointed because of how good Radiohammer could have been. If it actually had a music library that didn’t sound like a set of royalty-free midi tracks off a dodgy website, I’d be much more willing to recommend it. Well, that's also if you work on the basis that there aren't any other rhythm games worth playing instead, but that genre has had a real resurgence in recent years, and even if you don't have a PlayStation Vita (which has a real glut of them), then on the 3DS alone there's Hatsune Miku Project Mirai DX, and that one doesn't turn sexual assault into an "amusing" gameplay mechanic. Item Reviewed: Review: Radiohammer (Nintendo 3DS) 9 out of 10 based on 10 ratings. 9 user reviews.